Shikarpur, Pakistan (CNN) -- Aslaam Noon sits cross-legged on the ground in the scorching Sindhi sun. He raises his hands to the sky and cries out for God, and then he gently leans over and kisses the small mound of dirt in front of him. Buried underneath is the body of his eight-year-old son. Noon is overcome with grief and suddenly slumps over, unconscious. His male family and friends from the village surround him. "Become conscious," they say as they splash water on his sun-weathered face. As Aslaam Noon's eyes open, another cry bursts out from a relative sitting a few feet behind him. Tasleem Noon is facing a different direction. He is crying over two more mounds of dirt. The dirt conceals the bodies of his young son and daughter. "An injustice has been done to me," he cries. "I never though this would happen to me." In total there are three fathers from the large extended Noon family crying over their children's graves in the village cemetery. The cemetery is now surrounded by water. It survived the worst floods in Pakistan's history, but four of the Noon children did not. The Noon family thought they were safe. The entire village heeded the warning when authorities told them to get out as the floodwaters began bearing down on their village. The Noons and their neighbors sold their gold and some of their livestock to pay the exorbitant rates truck drivers were charging to drive them to safety. It was a good call. Some of the village was submerged in water while the rest was surrounded by it. Weeks after the initial flooding, the Noon family -- along with 300 other villagers -- returned home. They were happy to find some of their mud huts still standing. But the floodwaters weren't completely gone. Three days after they arrived, four of the Noon children drowned in the receding floodwaters around the home. In keeping with Muslim tradition, the men gather at the cemetery on the third day of mourning. Women are not allowed to join them at the grave site. The women are gathered together in the courtyard of a mud hut a few hundred yards away. Along the narrow dirt lane to the hut, a chorus of wails crescendos. Inside, dozens of women sit tangled together on the floor. The bed in the house is overturned, the chairs are pushed aside, and their tears are flowing freely. According to tradition, until the third day of mourning is over, the normal comforts of life are forbidden, which explains the flipped over furniture. Samina Noon is one of the three mothers who lost a child. She slaps her head over and over again. She keeps repeating the same chant: "My Golden boy. Oh God, give me back my golden boy." She knows that won't happen. "When they left home, they said they would be back. But the water wouldn't let them come back," she says, and then buries her face in her hands and sobs. Not only did she lose her son, but nieces and nephews as well. 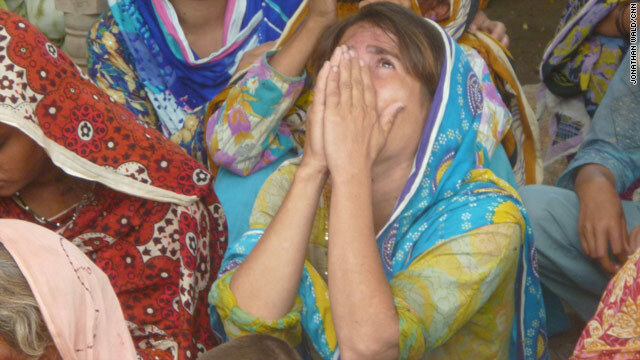 This is just one family's pain in a sea of despair in Pakistan. The death toll has now reached 1,645, but the government expects the number to rise significantly as the floodwaters recede, bodies are recovered and missing persons reports are filed. Many haven't bothered to file missing persons reports. It has been 15 days since mother Shazaadi Banglani from Jacobabad saw two of her children disappear under the swirling, muddy water. The floods entered their home overnight. She and her husband didn't have enough arms to grab all 10 of their children. She hasn't bothered to file a missing persons report because she thinks it is a waste of time. She is preoccupied with saving her other children and mourning the ones that are gone. "They are scared of the water now. They are sick," she says. The family sits on the side of a canal bloated with floodwaters. They have no tent, only straw mats to live on for now. She and the other villagers say they don't go to the government to file missing persons reports because they don't think the government will search for them anyway. Instead, they rely of fisherman to do the gruesome work of fishing out bodies from the floodwaters. Dargahi Mirani is one of those fishermen. He says the poor usually can't afford to pay him, so he volunteers. But some do and can pay. He says if they have the money, the poor pay about 500 rupees ($5). The middle class pay around 2,000 rupees ($25) and the rich 5,000 rupees ($50). "So far I've found 16 or 17 bodies," he said. He has no equipment. All he has are his strong swimming skills and the ability to stay underwater for long periods of time. He waves his hands through the muddy currents where the body was last seen and lets himself flow downstream, ever searching. The villagers helped the Noons find the bodies of their children. But the four deaths may not be a part of the government death toll yet. The Noon family says they haven't contacted authorities either. Instead, they are just trying to survive the overwhelming grief. The third day of mourning is almost over. As day breaks, the family is supposed to go back to a normal life. Clearly, their hearts are not ready for the sudden shift. Father Tasleem Noon cries: "What is left in my home? What is left in my life?"